and it can really put a damper on your life, because if you trip or twist an ankle and fall, you can do some pretty serious damage that may never heal properly, can cause permanent pain, and may prevent you from getting around on your own. Kind of a bummer. According to the National Osteoporosis Foundation, the disease is responsible for two million broken bones and $19 billion in related costs every year. Because of our aging population, experts predict that by 2025, osteoporosis will be responsible for approximately three million fractures and $25.3 billion in costs each year. Luckily, there are some things you can (and definitely should) do to maintain your bone density, and reduce your risk of developing osteoporosis. Move More: Physical activity and strength training strengthens muscles, which in turn strengthens bones. In addition, weight bearing activities like walking, jogging or any running or jumping sports actually help to make your bones more dense. Try to get at least 30-40 minutes of exercise each day, including 3 days of strength training each week. Limit Bone Sucking Foods: Foods like chips, fast food, salty snacks, soda and alcohol can actually steal calcium from your bones, so try to scale them back as much as possible. Eating too much protein from animal foods can have the same effect, so it’s a good practice to avoid super high-protein diets, and mix it up with plant proteins like tofu and beans. Drinking too much coffee and tea can also interfere with calcium absorption, so keep them under 3 cups each day. In addition, there are a few good-for-you foods like wheat bran, rhubarb, beat greens and spinach which can also interfere with calcium absorption, so be aware that if you eat these along with some dairy food for the calcium, OR your calcium supplement, you probably aren’t getting the amount of calcium you think you are. 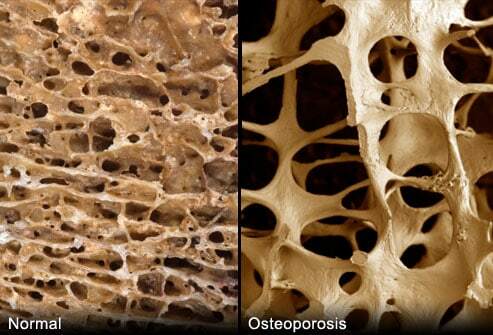 What do you do to take care of your bones?